Butter the scones, cut the crusts off the sandwiches, and fire up the kettle: it’s time for a Tea Party. Or, rather, a ‘T’ party, where Alice and her Wonderland-dwelling friends are transported to the modern world, and the T stands not for a drink with jam and bread, but for… Therapy. Fast-forward 152 years from the novel’s publication, and there’s a darker truth in this originally throwaway phrase: 1 in 4 people will struggle with a mental health issue in any given year. 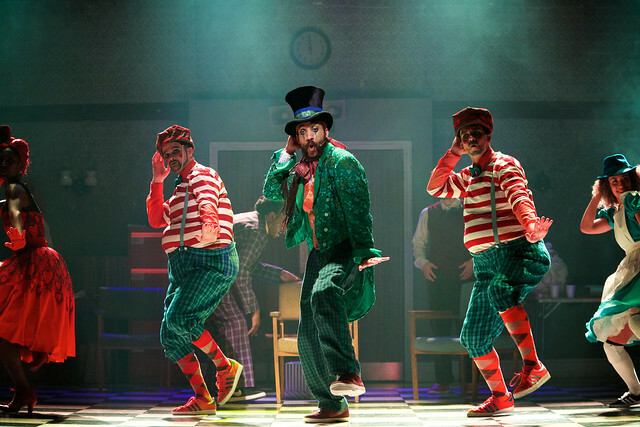 We may not all be ‘mad’, but we’re certainly not all ‘normal’ (whatever that means) either – and it’s this delicate balance that’s inherent in ZooNation’s colourful performance, directed by Kate Prince. ‘Kate is really good at dealing with serious issues in a sensitive yet humorous way,’ says ZooNation’s Teneisha Bonner who is dancing the role of The Queen of Hearts. ‘We know that mental illness and the struggles so many people have with it are very serious but it doesn’t have to be a ‘doom and gloom’ thing that people have to keep in the shadows. Actually, the show sparks conversation and dialogue. ‘If you don’t laugh, you’ll cry,’ interjects Rowen Hawkins, aka TweedleDee. This balance between the harrowing and the humorous is not just constructed in the dialogue; it’s inherent in the very fabric of the show and its style of movement. ‘It looks very aggressive but it’s not, it’s expressive,’ he says. In fact, as Andry explains, these boundary-blurring movements are often the most powerful for the audience, especially those dealing with the issues tackled in the performance. ‘They could relate with one of the characters straight away, the way that they were behaving made them understand the story,’ he says of an audience member experiencing mental health difficulties who came to see the show. ‘It was therapeutic for them to watch, and see their journey, but also enjoy it because they knew it was a performance: there was a slight detachment. Luckily, it’s this ‘letting go’, combined with the show’s uplifting message of acceptance, that makes all the difference. Ultimately, this nightly T party is a positive journey for the dancers too. 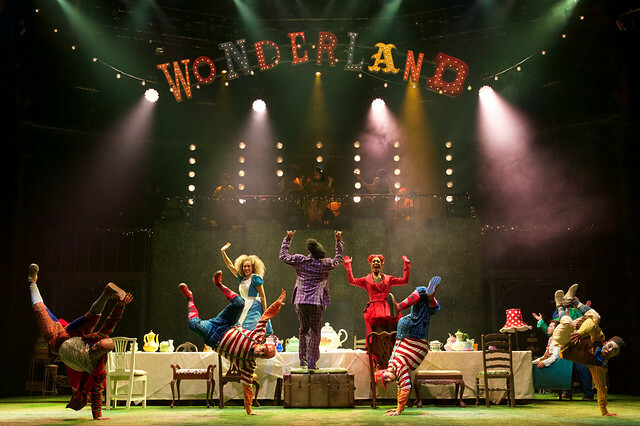 The Mad Hatter’s Tea Party runs at the Roundhouse until 22 January 2017. Tickets are still available. The production is staged with generous philanthropic support from Mrs Lily Safra, The Paul Hamlyn Education Fund, The Lord Leonard and Lady Estelle Wolfson Foundation, The Austin and Hope Pilkington Trust and The Royal Opera House Endowment Fund. Time To Change is an organisation which aims to end mental health discrimination. To learn more, visit their website. Please tour with this & bring it to Norwich!